A Volunteers In Mission team representing St. Stephen’s UMC in Norman spent a week teaching music to congregations in Savannah-la-Mar, Jamaica, earlier this year. “We went at the request of Abasilum Smith, who is the pastor of six Methodist churches” in that area, said Venita MacGorman, the Norman church’s director of music ministries. 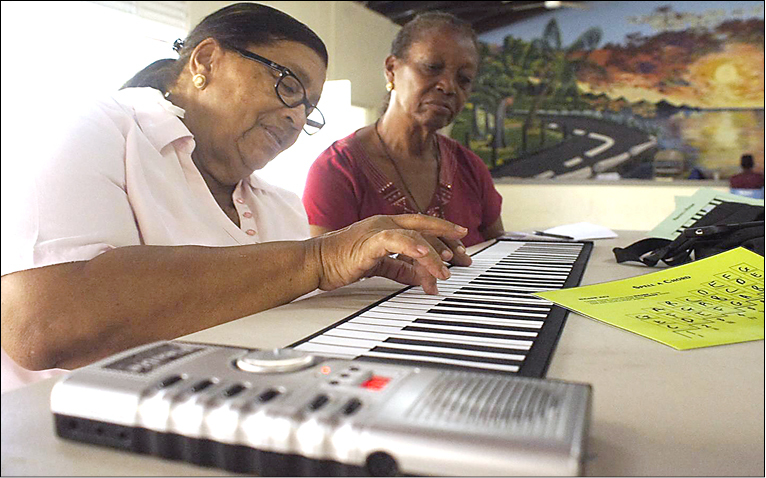 Adults in Jamaica practice playing a keyboard for their Methodist church. For decades the churches had been using an edition of the British Methodist Hymnal that had only lyrics, no musical notation. Rev. Smith’s churches recently had obtained new Caribbean Methodist Hymnals, but the people needed assistance learning the hymns. Many lyrics were set to traditional Caribbean tunes. That’s when Smith sought help from St. Stephen’s. The 14 volunteers worked day and night with adults and children. They began with basic music reading skills and basic instrumental techniques. The VIM team took instruments donated by Oklahomans, including eight guitars, four roll-up keyboards, 36 recorders, music stands, and lots of drums and other percussion instruments. Volunteer Marci Corey, music director at Piedmont UMC, said the experience was rewarding and inspiring, but also hard work. Some students took copious notes and traveled great distances for the opportunity to learn music. Norman dentist George Wulfekotte, an amateur guitarist, described one of his favorite moments. During an evening performance, a smiling little girl sat next to him. MacGorman said she was pleased with the progress made by the Jamaican music students in just one week. Jeni Markham Clewell, associate pastor and director of children’s ministries at St. Stephen’s, hopes that first mission trip leads to a long relationship between Jamaica and Norman. A second VIM team from the church went to the island in July. “The Methodists in Savanna-La-Mar trusted us with their dreams of having music play a more vital part in their worship of God and in their daily lives. We were honored to receive that trust and blessed beyond measure by their gracious friendship and warm acceptance,” said Rev. Clewell.